Table plans can often be a last-minute, difficult task in the lead up to an event. 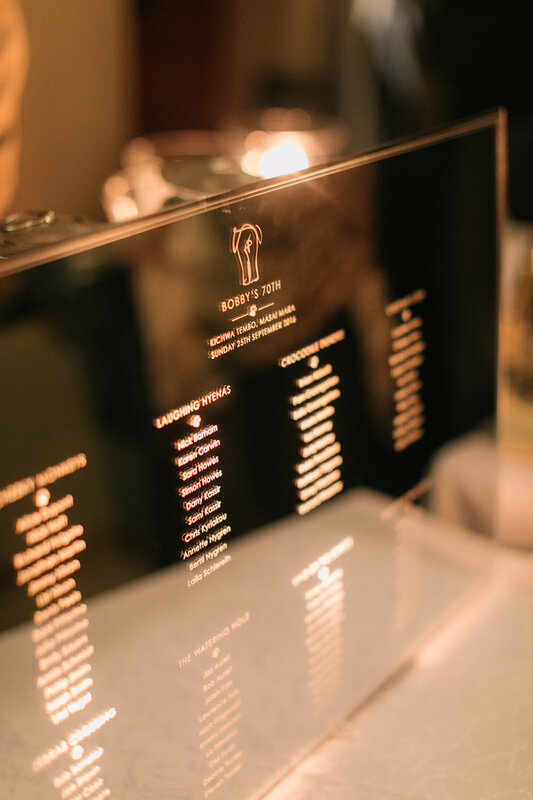 However this stunning mirrored table plan board is definitely worth the effort! Luxury stationers Cutture, who specialise in laser cutting, designed and created this laser engraved silver mirrored acrylic table plan. The design is engraved onto the back of the mirror allowing light and colour to shine through. It is a fabulous way of attracting your guests' attention to the seating arrangements. They often even take photos in it! The best part is that after the event you can frame the table plan and hang it in your home, reminding you of the wonderful event and all of the guests who shared the day with you. For this particular event, a 70th Birthday in the Masai Mara, Kenya, we used African safari themed table names, for instance "Crocodile Dundee", "Laughing Hyenas" and "Cheeky Monkeys". And of course, the head table was called "King of the Jungle". Click here to see more photos from this event, and check out Cutture's latest work here.